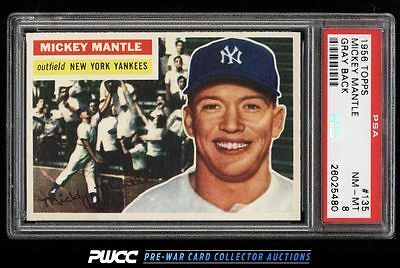 A truly exceptional '56 Mantle which boasts tremendous eye appeal for the issue. Almost dead centered with four unquestionably NM-MT+ to MINT corners, chipless edges, and clean surfaces throughout. This card really shines. An almost imperceptibly bit of toning in the lower left region of the card is perhaps all that keeps this from grading an 8.5 in our opinion. Very hard to locate a better PSA 8 anywhere in the hobby. One of nearly 17,000 cards, lots, and sets up for bid in our 8th Auction of 2016. Click on the link above to view the other PWCC auction lots.